Please Donate to this website site to help it stay active on the internet, your donation will help to pay for website fees, Thank you. Just thought I would send a comment and a photo of my last camping trip. I have had my trangia for more years than I care to remember, its been a very reliable companion, mainly being used for family camping trips, the model I use is the 27 with kettle which is the perfect size for the two of us,i prefer the spirit burner to the gas burner, meths is readily available everywhere, also it cooks a lot quieter than gas. 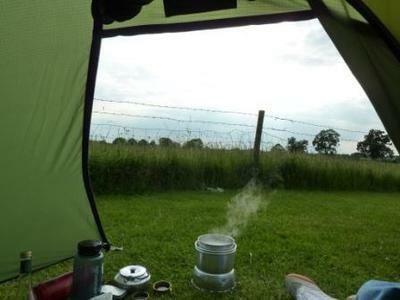 I have recently started solo cycle touring and im thinking about getting a mini trangia to reduce the weight, It would be nice to see other viewers comments about the mini trangia, or what stove they use for cycle touring. I just thought I'd post an alternative viewpoint. I have cycle-toured with a Trangia triangle for a number of years. If you're dedicated to ultimate weight-saving, this is the thing to have. But it's not without problems. It has a small base area, which can make it unstable on anything but a flat surface.The cooking pot is supported by three small upstands, one in the middle of each side, which means the pot is awkward to centre, only supported over a very small area, is easily knocked over (when being stirred, for instance) and has little resistance to sliding sideways. I've had a couple of mishaps that way. The burner is quite low and has a tendency to burn the surface it's standing on e.g. a picnic table. The wind shield effect of the triangle is not particularly efficient either. The spirit burner cannot be lit until it has been set up in the triangle. This is awkward if you use a lighter, and even more awkward if you are using a fire-steel to light the burner since you are moving your hands sharply downwards in the region of those sharp-pointed upstands mentioned earlier. This year I am going to take a 27 instead, which should offer greater security, better pan-support and wind-resistance, and will be easier to light - at the cost of a few grams of extra weight. But I'll make sure I've got a spare burner and the triangle along as well, just in case! I totally agree, trangias are a reliable companion, other people I talk to feel the same too, and for those who have had trangias handed down to them from family members, they get quite reminiscent and sentimental about their stoves. Join in and write your own page! It's easy to do. How? Simply click here to return to Your Trangia Reviews. Coming soon ; More info on Vintage Trangias, plus the Trangia photo gallery, & many more interesting pages, please visit regularly to see the latest updates ! Click below to see all the latest Trangias and Trangia accessories on Ebay. All articles & images are property & copyright of the owner & publisher of trangia-central .